Not the cheapest shared host around, DreamHost does offer superior technology at an affordable price. Known amongst webmasters for their reliability and server speed, DreamHost provides new customers with a two-week free trial. Notably, they have the longest money-back guarantee of any web hosting company reviewed to date — 97 days! While support services are provided via ticket-only, the excellent technical merits of their services as well as their ease of use warrant consideration. On balance, DreamHost has earned the NCM Online designation of RECOMMENDED WITH RESERVATIONS. Popular amongst internet professionals for their reliability, server speed, and numerous shared hosting features, DreamHost does not follow the crowd. They are a company that does things in their own way. With 1 million plus active hosting accounts as a testament to their success, they must be pleasing a lot of customers. We don’t often come across web hosting companies that offer free trials, but DreamHost is an exception. Completing the sign up process entitles customers to try the service free for two weeks. If you are satisfied after the first 14 days, they bill your credit card. If you are unhappy, you can cancel at any time during the trial period without being charged a single cent. We were pleasantly surprised to receive an e-mail 3 days prior to the trial expiration reminding us that the free trial was coming to an end. We did not cancel. DreamHost proprietary control panel. Click to enlarge. Accounts are set up immediately and the “Welcome” e-mail includes all of the information you need to get started. We had our NCM test site free trial up and running in less than an hour after signing up. DreamHost proprietary 1-click WordPress installer. Click to enlarge. 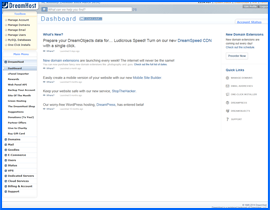 DreamHost utilizes a proprietary control panel (screenshot above right). Owing to the intuitive navigation menu, it is fairly easy to master within a few minutes, and should pose no problems for beginners. Unlike a number of other hosting companies with their own custom control panels, we did not encounter any issues with the DreamHost Dashboard while setting up our site. 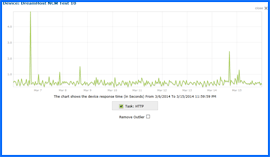 DreamHost Uptime Test Results Chart. Click to enlarge. DreamHost provides a proprietary 1-click script installer (screenshot above right) for CMS applications like WordPress, Joomla, Concrete5, Pligg, MODx Evolution, and others. It will also install Zen Cart, the popular ecommerce shopping cart, with a single click. 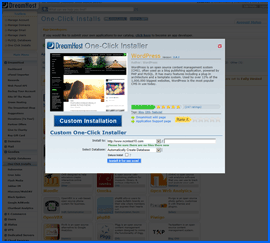 We found their 1-click installer to be the simplest we have ever encountered and ideal for beginners. In addition to shared Linux hosting, DreamHost offers VPS (virtual private server) plans, cloud server plans, and dedicated server plans — all at additional cost. DreamHost Speed Test Results Chart. Click to enlarge. All web hosting services reviewed by NCM Online are purchased and subjected to our 10-day test for uptime and speed. To date, DreamHost is one of the fastest shared hosting services we have tested, scoring a highly impressive average speed of only 1.119 seconds to load our test site from 13 locations worldwide, and only 0.8707 seconds from 7 U.S. locations. Tested for uptime every 15 minutes over 10 days, DreamHost produced a perfect 100% reliability score. 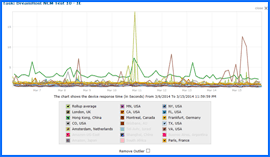 See screenshots of Uptime and Speed Test Results Charts right. Providing a wide range of unlimited hosting features and the superior technical performance favored by internet professionals, DreamHost is also easy to use for beginners. While they are not the least expensive shared host in the industry, DreamHost packs a lot of value into their service for less than $10 per month. DreamHost has earned 4 stars and is recommended with reservations by NCM Online. Cheap website hosting company price comparisons based on 1-year term list price before coupon/promo codes or limited time/introductory offer discounts. These are the renewal rates for the second year of hosting. To ensure that you receive the most affordable DreamHost pricing possible, please visit our Web Hosting Coupon Codes page for current discounts and special offers before making any purchases. DreamHost has been hosting their clients’ websites since 1997. That was back when four Computer Science undergraduates from Claremont, California established the firm with no capital save for a single Pentium 100 web server, which was fondly called Destro, and using a shared bandwidth from a T1 line that given by a friend for free. DreamHost remained frugal due to necessity; however, even with limited resources DreamHost did their best to offer great service at a reasonable cost. The early days of the business forced the firm to be creative and employ innovative solutions to meet their customers’ needs. It’s a practice that’s remained as they have decided to build most of their own technology; the practice sets them apart from the competition. DreamHost’s technology is created by some of the industry’s brightest developers on stable systems; they’ve worked together to give a positive user experience. DreamHost have designed everything to be easy-to-use and with their clients in mind. So far, they did the right thing. Over the past ten years or so, DreamHost has developed into more than 1500 servers, high-tech data centers, and a full-time staff of more than a hundred employees. The company now hosts more than a million domains. They’re focused on giving high quality customer experience supported by the industry’s best web hosting technology. It’s an eternal quest, but it’s a journey they’re happy to take. DreamHost promises to always take a customer’s business seriously and constantly search for ways to expand their offerings, enhance reliability, and develop the overall service quality. After all, your ideas set you online, but the hosting companies such as DreamHost help you stay there. When DreamHost found out that they produce more carbon dioxide than 500 average households, they knew they have to find ways of offsetting their emissions. By conducting some research DreamHost discovered that the most efficient approach starts with resource conservation: shutting off the lights, decreasing travel, printing both sides of the paper. Efforts were increased to find out how to do more with less. The next phase was to use clean and renewable energy. Since there’s no option to set solar panels up or obtain power from a green power utility, the company bought Renewable Energy Credits instead. Finally, to counterbalance those unavoidable emissions, they’ve also invested in “offsets” through the Emission Reduction Credits which ensures that their residual impact is removed. The credits that the company uses for green energy consumption for neutralizing the remaining emissions meet the industry’s highest standards. They’ve also linked with the U.S. Green Chamber, joining their “100 Cities for Change” program. The program’s goal is to assist and support sustainable business practices that encourage energy efficiency, job creation, innovation, and a better economic future. This video tutorial demonstrates the installation of WordPress on a DreamHost shared hosting account using their proprietary control panel and applications installer.